Svanurin, the Swan, is built in 1900 by Hans Jacob Hjelm in Vágur, a famous boatbuilder. The building costs were 300 kr. Svanurin is a 10 oar boat and was built as a fishing boat, which also could be used in whale hunting. There were 10 owners of the boat, and eventhough 30 kr. was a lot of money in 1900, the fishieres were so good that the owners got there money refunded with in a short periode of time. Svanurin was used for fishing from 1901 until 1918, mainly during the winther periode. The last delivery of fish was on 22. of May in 1918. After this most of the commercial fishing in Vágur was with larger boats with engines. Svanurin has since it was built been used as a whale hunting boat. Svanurin was also known for its speed and for the same reason was also used in rowing compitions. 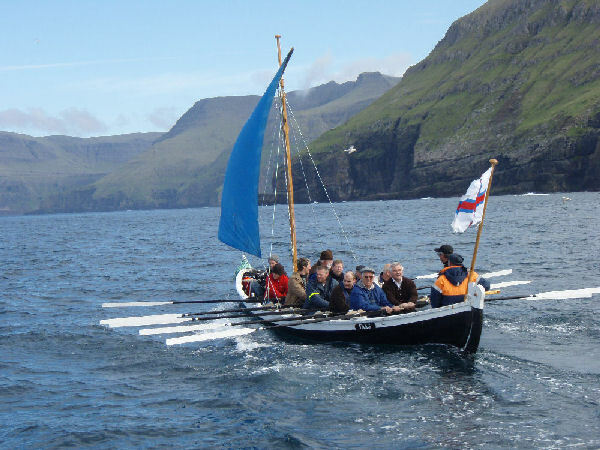 In the 3-year period 1941, 1942 and 1943, Svanurin competed at St. Olav’s day, Faroe Islands national day, and won all thee years, which also resulted in Svanurin winning Veðrasteypið / the Ram Cup. The cup is today on exhibition at Stóra Pakkhús.